These are all of my current works in progress. On the design wall, on another design wall, in a design basket, in another design basket, in another basket, and on my design floor. If I have the creative urge to start something new...I do. I end up finishing everything I start..it's just that my order gets out of sync along the way! Books I am reading along with a scrappy solids pincushion ala Jean Wells. Now, I know I said pincushion. I like to think large. So what if it ended up as a little pillow? It will be done as soon as I add some pins. 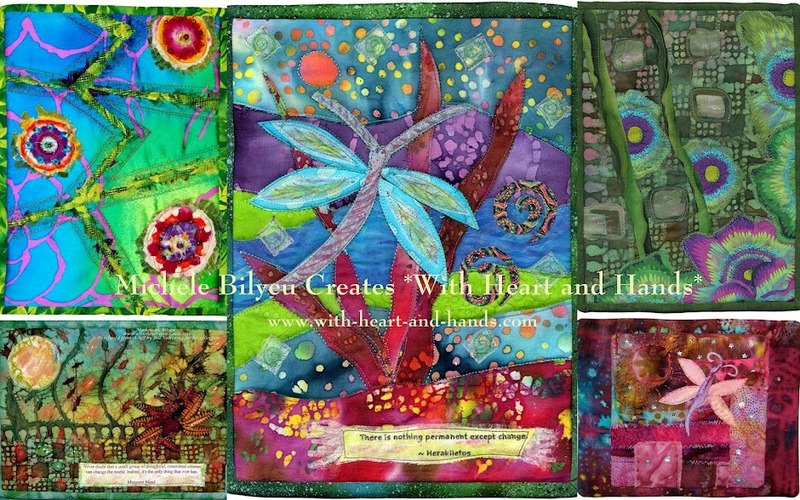 Six art quilts in process. Now, I know I said six. And I really have seven. One is already in its envelope at the bottom of the collage. It is completed. They are not. A basket with 4 little quilts in it. Now, I know a couple of them look done...they just need a label. The other ones? Not so done. In the center, my progress so far on my Jean Wells class quilt. I've managed three more blocks and some potential borders...but I like how it looks just hangin'...in process, like me. One very large, very bright quilt you need sunglasses to look at. Imagine me sewing on this thing. No wonder I'm resting from it right now...my eyes are tired and I have indents on my nose. One AAQI quilt in its Priority Mailing envelope ready to mail. I was at the Post Office on Friday.....picking up more of these little free envelopes, had the little quilt with me, but forgot the mailing address to write on it. Now, I know.....I said (above) that it is done, but obviously 'mail to go out' is not yet mailed, therefore not done. 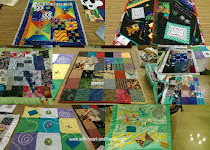 And if you look under the design table under the six art quilts...oh no! More to do's and therefore not done's under there! And where am I? I am upstairs in my 90º degree sewing loft. I am having every kind of hot flash a woman can have. Stick a fork in me, I am done. Where's that quilting cat with the fan and the grapes? Hi Michele: your photos aren't showing up on your post, fyi. Thanks Brenda, I thought it was my computer or internet connection. No photos seen here either but it sounds like you've got a lot going on! I have multiple knitting projects (and lots of experience) but as a novice quilter I have only one major project at a time. Now THIS is weird because I completely see them and their html links show up as correct in the post editing. Will redo and see what happens!!!! It sure looks like you're having fun! 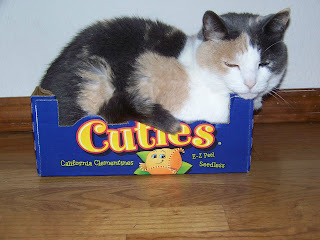 I love your cat in the Cuties box- and I don't know how you find the time to create so many beautiful quilts... I know - you don't need much sleep, your organized and you have lots of energy from those hot flashes VBG.. I will look forward to see your next post..
Wow are you busy, but creative. Time to pull out the ice cube trays and take a cool soak in the tub. Love the photo of your cat. Very cute. Long hot soak in the bath I think, with the coffee facial scrub, followed by that chilled bottle of Sauvignon. I can see the photos. You are one productive woman! The photos are being seen by me, and they are great by the way ;-) Love all your WIPs, but especially the pincushion/pillow! Yesterday, no photos. Today, here they are! That quilting cat is trying to stay cool and calm, not even thinking about grapes. Take a break, woman! I'm laughing at how funny you are. 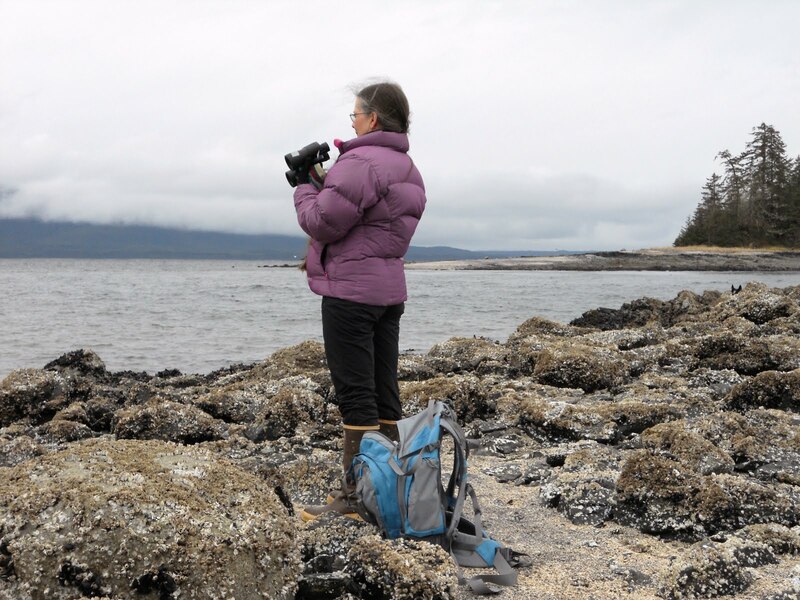 Everyone is telling you to slow down or your photos are missing. I see them and you and I can guess what you are up too...good luck! Oh my, it looks like you suffer from "Quilter's ADD" too! No wonder you get so much done! One step at a time - or in your case, three - and you'll get there. hee hee! 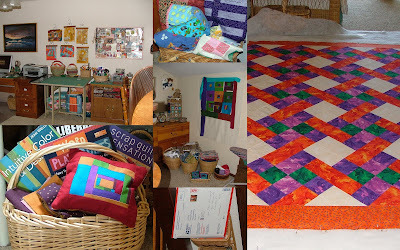 I love that quilt on your design floor! Not too bright for me! Love all your projects----you are one busy gal! Your cat is so cute in her descriptive box!!! !